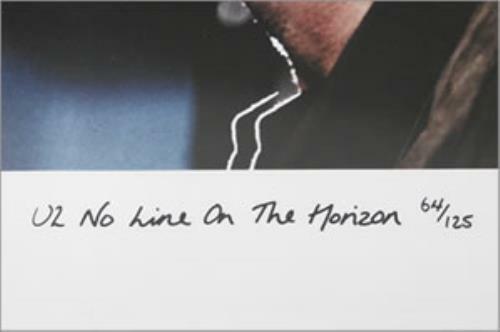 U2 No Line On The Horizon (Ultra rare 2009 UK promotional-only limited 34" x 15�" framed artwork proof for the album which was given as a radio station competition prize. 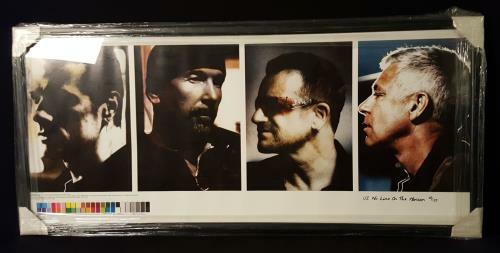 This unique piece of hand-numbered artwork features 11" x 8" individualportraits of Larry, The Edge, Bono and Adam, with white borders, plus printers colour coding chart and the date 10.02.2009 in the bottom left corner. The bottom right corner features 'U2 No Line On The Horizon' in black handwritten-style script and is hand-numbered 68 out of 125 copies! Beautifully framed and glazed to take PRIDE of place on your wall).